If the economy has left you unable to easily afford your mortgage you may be considering a mortgage modification in order to make the payments easier for you to make a month but figuring out how to successfully modify your mortgage is the key to the entire effort of trying to modify your mortgage. There have been many that have attempted to have their mortgage modified but have been rejected for a mortgage modification. According to statistics the success rate for letting a law firm handle mortgage modifications is high when compared with the success rate of doing a loan modification on your own but there are some things that you can do if you are deciding to attempt a mortgage modification on your own. Communicate – When attempting to modify your mortgage you will more than likely spend a good deal of time on the phone with bank representatives. It is important to keep in mind that some of the time that you spend on the phone will be productive and some of the time won’t. When speaking with representative it is important to get the name and ID number of the person you are speaking to and also to take notes of what you told them and what they said. Do Your Math – Before attempting to start the process of a mortgage modification you will want to do some calculations to make sure you will be considered a candidate for a loan modification. The general rule of thumb is that your monthly mortgage payment should be below 31% of your monthly income. If your mortgage is already under 31% of your monthly income you will more than likely be denied a mortgage modification. Explain Your Situation – When you apply for a mortgage modification you are usually required to write a hardship letter but sometimes instead of giving you the opportunity to explain your situation in a hardship letter the bank just asks you to check off a generalized situation in a box on a form. It is a good idea regardless of if you are asked for a hardship letter or not to write one and give it to the bank. In your hardship letter you should explain your situation as to why you feel you are unable to afford your mortgage at its current amount and how you intend to make the monthly mortgage payments once your payments are lowered. Try Again – If you have been denied a mortgage modification previously it does not hurt to try again especially if your financial situation has changed since the last time you applied for a mortgage modification or if you applied for the modification over a year or so ago. You may be suprised to find out that they may approve you this time around. If You Need Help – Ask – Asking for help can make a huge difference in the outcome of your mortgage modification approval. Hiring a real estate lawyer to handle your mortgage modification sometimes gets a higher success rate because a lawyer will be able to sit down with you and let you know what you should expect and if a mortgage modification is something that you will or will not be appoved for based on your specific situation. A law firm handling mortgage modifications will spend the time on the phone with the bank for you saving you hours upon hours of time on the phone with the bank and as mentioned earlier mortgage modification lawyers often have a higher success rate in mortgage modifications than a home owner would because they are experienced in this field and know the in’s and out’s of the mortgage modification process. If you would like to speak with a mortgage modification lawyer in Staten Island, New York call 718-979-4300 or email us though our contact form. Steven T. Decker is an experienced real estate lawyer, author and speaker. With over 20 years of experience, Steven represents individuals and investors in the purchase of residential and commercial real property. 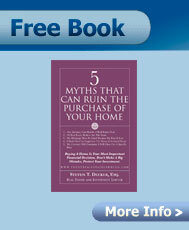 Steven is the author of "The Five Myths that can Ruin the Purchase of Your Home" and he is the publisher of the "New York Real Estate Law Blog". If you are buying or selling a home or commercial property in Staten Island, New York City or New Jersey contact Steven T. Decker, Esq. to discuss the services that he offers and how his legal representation will assist you. IMPORTANT DISCLAIMER: The information contained on this website is provided for general educational purposes only, should not be relied on as legal advice and does not serve to create an attorney client relationship. In utilizing this website you acknowledge that there is no attorney client relationship between you and Steven T. Decker, Esq. and that the information contained on this site does not and cannot serve as a replacement for the competent legal advice of a licensed attorney in your state. The content of this website is subject to the Copyright of its author, Steven T. Decker, Esq.